As part of Gerry and Friends, one of the four bands who did brief opening sets at the 2014 Maimonides Battle of the Bands fundraiser in Montreal, we had Peter Noone (the singer from Hermit’s Hermits) and Vance (the band’s guitarist) join us for Ferry Cross the Mersey. 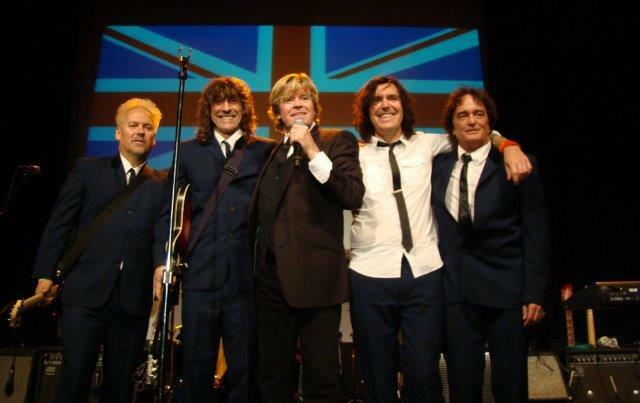 That was fun, but when Herman’s Hermits did their own set, I was amazed at how good they were. Noone is an excellent singer, a fabulous front man, and the band’s musicianship was remarkable, from powerful drumming, two great guitarists (who produced a wide range of sounds, from their 12-string guitar imitation by the two of them playing lines an octave apart, to the volume swells in End of the World, and the ricky-ticky ukulele sound of Mrs. Brown), and a fine keyboard player (who supplied the bass with his left hand, and later played bass guitar), and they provided strong background harmonies. The band had so many hits, they didn’t even play them all, but we did hear I’m Into Something Good, What A Wonderful World, Dandy, A Must To Avoid, The End of the World, Silhouettes, Listen People, Can’t You Hear My Heartbeat, Mrs. Brown You’ve Got A Lovely Daughter, Henry the VIII (with a Ramones-style intro ! and audience sing-along), and There’s A Kind of Hush. In between the hits, Noone joked with the audience and the band goofed around with brief versions of Ring of Fire, Battle of New Orleans, Jumpin’ Jack Flash, and a heavy blues rock riff with intentionally indecipherable lyrics. I enjoyed them so much I went back the second night to see them again, and the set was somewhat different. What a band ! This interview was recorded December 4, 2014, backstage at the Metropolis, Montreal, Canada, before his terrific performance with Herman’s Hermits. Craig Morrison : What is the motivation that made you want to join a rock and roll band when you where a young teenager ? 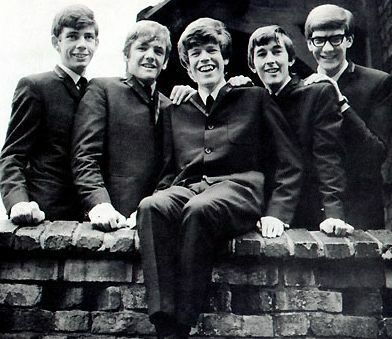 Peter Noone : The motivation was that all the people that I liked were musicians. I liked Buddy Holly, Waylon Jennings, and the Everly Brothers and when they came on the radio in my house I thought, oh I can sing like that ! And Roy Orbison, oh I can sing [singing] “I was alright” [the opening phrase of “Crying”]. So I thought, oh I’ll be a singer. I went to a college of music and they were trying to teach me to be a musician, but I wasn’t listening. While I was there, they got me a job as an actor on a television series, so I got some money and a bought a van and all you needed to be in a band was to own a van, and I became the singer in a band. PN : Yeah, ’cause our first band was called Pete Novak and the Heartbeats. No, the first band was called the Cyclones, then we became the Tornados. We were trying to call ourselves after a hurricane or something like that. There was Rory Storm and the Hurricanes [in Liverpool]. So we had the Cyclones and there was already another Cyclones [also in Liverpool] and there was already another Tornados [Billy Fury’s backing band] so we called ourselves The Heartbeats after Buddy Holly. The Hollies were called the Hollies and the Beatles were called the Beatles and we were called the Heartbeats. CM : All in tribute to Buddy Holly and the Crickets ! What kind of music did your family listen to at home ? PN : My father was a trombone player, and he played all of that [sings the melody of Glenn Miller’s “In the Mood”] but he was classically trained. My auntie was a piano player. My grandfather was the organist at the church and my grandmother was the choir mistress—you used to be able to call it that in those days—for the choir. So there was loads of music but my grandparents banned certain music from the house, and I lived with my grandparents. Once, I can remember hearing Elisabeth Schwarzkopf and my grandfather breaking the record because she was a Nazi. I realized there was all this stuff that I wouldn’t hear because of politics, and rock and roll was politically incorrect. So there was no rock and roll at home. I would visit my parents who lived in Liverpool. My grandparents lived in Manchester and I went to school in Manchester. They never knew where I was. I was always out with my friends and all my friends liked music. That was our connection, whether it was Chris Montez or every kind of music we liked. We went to see Little Richard, we saw Jerry Lee Lewis, and the Beatles. We saw Eddie Cochran, Gene Pitney, and we saw Gene Vincent. They all played in our town. Or we’d go in somebody’s dad’s car and go see Sam Cooke. It was all about music, that’s what we did. Some of us had stamp books and some had record collections. I had a bit of each. I had a train spotting book but stopped that when I was about thirteen and concentrated on music. It was all just about music, everything. It was the beginning of portable music. There was now radio that played rock and roll and people had transistor radios ; you could play music in your own bedroom that didn’t interfere with life. Even though there weren’t headsets you were still able to listen to music that nobody else could hear basically. I had a record player that was battery operated, with a lid that came off that was the speaker, and we traveled around with that and we played records on it and danced on the bridges and stuff like that. There were no drugs and no alcohol. There wasn’t a bunch of twelve year old kids under a bridge saying “lets get some booze,” none of that. Everybody just played music, everybody wanted to learn how to play, and everybody had a guitar and a kit. In those days there was no drum kit but there were washboards, and there was always someone bashing on a can and everything. We had a drummer who was pretending he was a drummer and all he needed was time. We had loads of time. Everybody was kind of safe. When I was a kid, people could leave their kids out until ten o’clock at night, eleven o’clock and think that they would be safe. CM : And the house doors were unlocked. Someone knocks on the door : We’re next. PN : We’re next, I’ve got to go. Is that good enough for you ? CM : Yes, wonderful. Thank-you. PN : We’re on ! See you later, man.